If I didn’t know any better, I’d think I was giving away my soul for a good warm Saxon meal. In the city of Leipzig, Germany, the name and influence of Johann Wolfgang von Goethe doesn’t stray far from conversation. Three more words are at the tip of the tongue: Faust. Pact. Devil. Near the city’s central square at Markt, the Mädler-Passage beckons with bright lights and the promises of goods and riches within the shopping arcade. 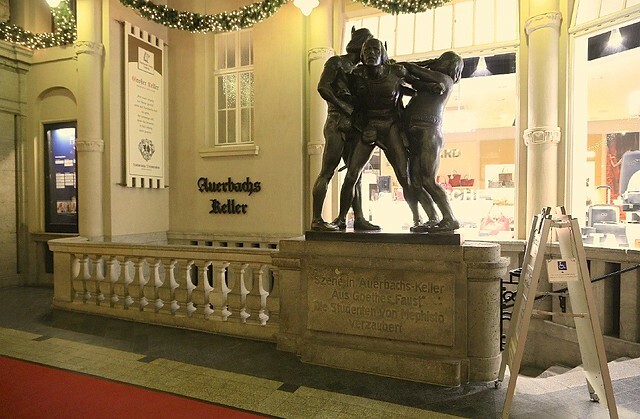 At the arcade’s north entrance, all are greeted by statues representing figures from “Faust”, the most famous published work by Goethe. Signs to Auerbach’s Cellar lead downstairs on either side of the main passage. One thought remains as I walk into the basement. Am I sealing my own deal with the devil, setting foot in the Cellar’s chambers to sign away my freedom for some food, drink, and hospitality? I’m sure the evening won’t be that dramatic. But the moment I walk in the door, I’m in the midst of culinary and literary tradition spanning many centuries. Scene in Auerbach’s Cellar from Goethe’s Faust: Mephistopheles casts a spell on the students. Scene in Auerbach’s Cellar from Goethe’s Faust: students bewitched by Mephistopheles. 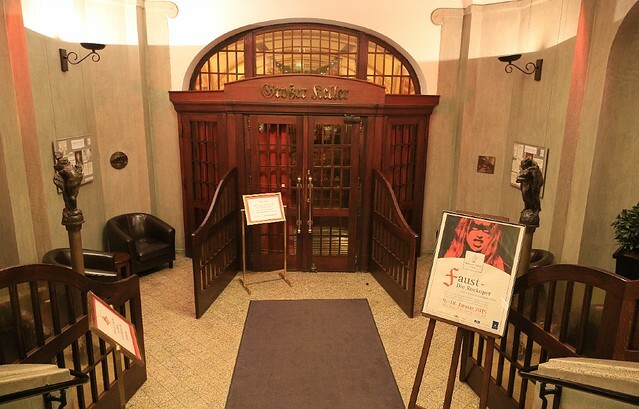 Entering the ‘Großer Keller’: what could possibly go wrong? Welches gesehen viel Mutter Kind. As many a mother’s son did see. And the Devil’s wages got for it. As a student of Leipzig University, Goethe began visiting the cellar in the middle of the 18th-century and seeing the 16th-century paintings of the barrel ride in the tavern inspired him to write his version of “Faust” based on the life and times of late 15th- to early-16th century German magician Dr. Georg Faust (Faustus). Goethe included a scene within Auerbach’s Cellar, memorializing the tavern for posterity. In 1911, merchant Anton Mädler purchased the entire Auerbachs Hof building to construct his own functional building for the trade fair. His original plans to demolish the historic building were met with worldwide outrage and protest; he compromised by retaining and enlarging Auerbachs Keller. The present-day shopping arcade bears the name of Mädler-Passage. 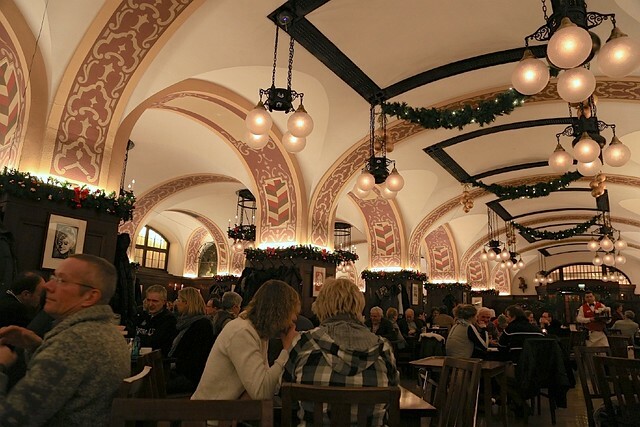 Built in 1912/14 together with the Mädler-Passage, meals served within the “Großer Keller”are primarily simple dishes & Saxon specialities, as well as dishes accompanied by beer. I’m very happy to see that the traditional tavern – pub – restaurant tonight is busy but not rowdy. Inside the front door, I announce my arrival, and soon Mr. Rothenberger arrives to greet me, welcoming me to their restaurant. He leads me towards a table at the back of the restaurant. While I’m seated for the next ninety minutes, Mr. Rothenberger is on the floor tonight for the first part of the dinner hour, greeting the evening’s guests and escorting them to their tables. 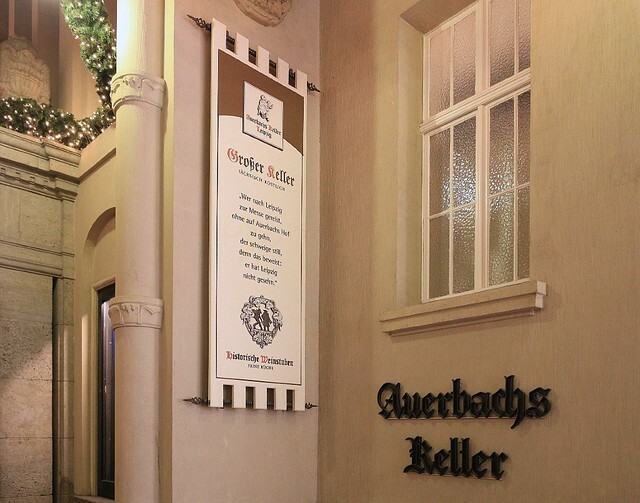 Mr. Rothenberger and his wife have operated Auerbachs Keller Leipzig Rothenberger Betriebs GmbH since 2006. I’m suddenly hungry, once I’m enveloped by the warmth of the underground restaurant. The many choices on the menu paralyze me with indecision. Conscious deliberation leads to decision, and a server responsible for my area arrives to take my order. 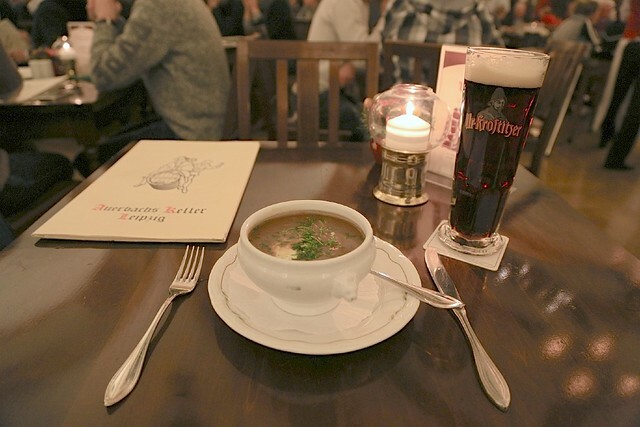 But it is a cold evening, and I’ve been craving soup while I’ve been wandering the streets of Leipzig’s Old Town over the last couple of hours. From the description, I’m confident the mushroom soup will be a dark creamy mix. Arrival of a white porcelain bowl confirms my educated guess. Rich, creamy, earthy and chunky with a generous portion of mushrooms and fresh herbs, I make quick work of the soup. The soup deserves a portion of bread, although bread and butter are clearly listed as an extra. That’s too bad, because I think soup this good should come with a good chunk of bread. I take a big quaff of my Schwarzbier to clean my palate. Down down the dark liquid goes, and a third of my beer is gone. Aaaaaah, refreshing. The chicken breast is lightly breaded, but I find the breading oversalted, even though I’m very familiar with how much salt fits the German palate. Fortunately, the thin crispy crust gives way to tender and juicy white meat within. The vegetable ragout and noodles provide a “lighter” counterpoint to the meat. The breading, ragout, and herb cream sauce could also do with more black pepper, but that’s not traditionally German. I had expected this main dish or entrée to be too “heavy”, but a typical “meat and starch” done up Saxon-style with my plate of “chicken and noodles” does its job well. There’s crowd noise but it’s not obnoxiously loud. People seated in adjacent tables are clearly having meaningful conversations without having to bellow at the top of their lungs. Behind me are round tables surrounded by many in lively yet hushed conversations, accompanied by the sounds of glass mugs “klinking” and “klunking” against wood tables. I ask my server about these people, and he confirms my hunch. One last sip of my beer summons up a bit of courage. I stand up, walk over to one of the tables, and I ask in passable German whether these tables are reserved for long-time regulars (“Stammtisch”). A woman in her sixties kindly answers some have been coming for years, others over decades. We chat for a little and when she asks about me, I tell her about my first time in both Leipzig and the Keller. With a smile, she wishes me well, and that she hopes I find my way back to Leipzig sometime soon. “I’d like that very much” is my parting reply. At the front door, I tell the night manager the evening has been an excellent experience: “leckeres Essen aber etwa zu salzig, bequem und gemütich, gute Stimmung.” (“good food though a little too salty, comfortable and cozy, great mood”). The night manager nods and smiles, and hopes I return to the Keller soon. 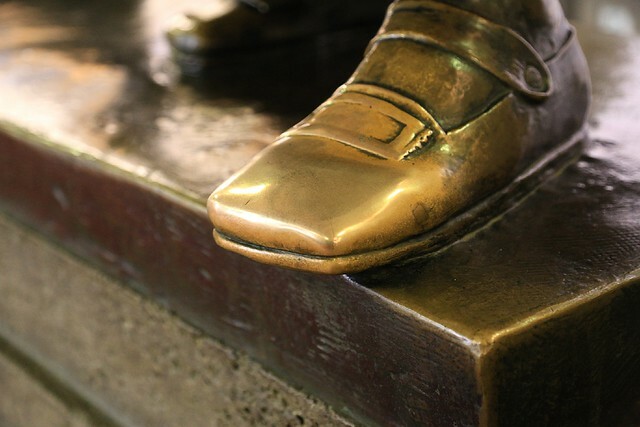 Back up the stairs, I stop by the statue to give the shiny brass shoe a rub for good luck. As I exit the building for the lively streets of the “Weihnachtsmarkt”, I feel a gust of wind at the back of my neck, a short whisper, but a quick turn reveals there’s no one behind me. I’ve generally traveled alone over the last twenty years with pursuits reaching far-flung places under the guise of astronomical research and personal writing. Although a few reasons have changed and evolved naturally, I’ve come to terms with how and why I travel. Fact is, I’m “always” coming back home to Germany. And now, I’m already thinking about coming back to Leipzig, even if I have to make a pact and give up my soul in the process. 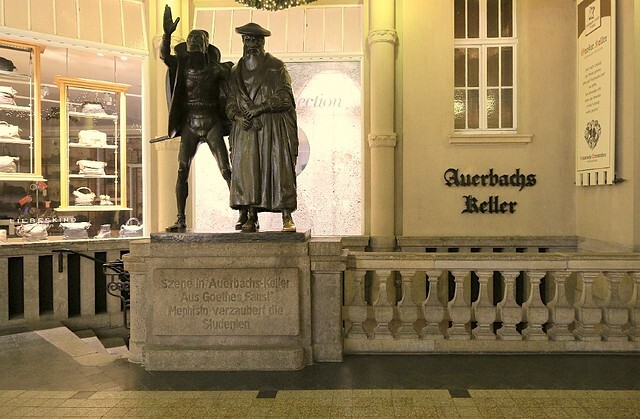 Auerbachs Keller is roughly in the middle of Leipzig’s Old Town, near Old City Hall, S-Bahn Markt station, and Augustusplatz. The place is divided into three main areas. On the ground floor is the coffee and cocktail bar, Mephisto Café. 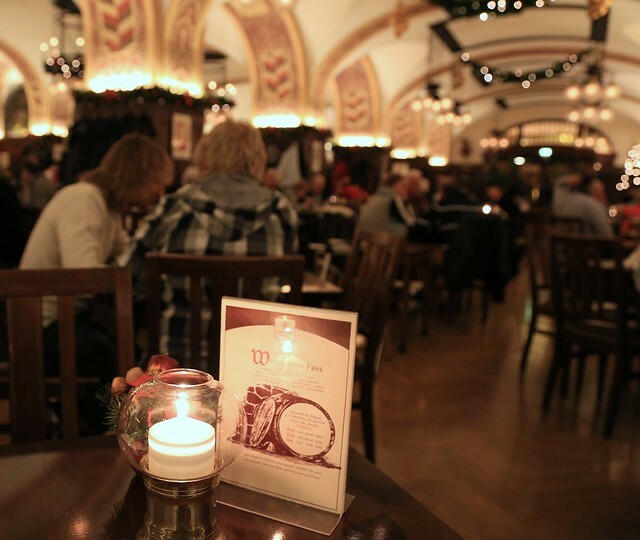 In the basement are the Great Cellar (Große Keller) and the Historical Wine Bar Restaurant (Historische Weinstuben). The latter consists of separate rooms: the Cask Cellar (Fasskeller), the Goethe Cellar (Goethe-Keller), the Luther Room (Lutherstübchen), and the Old Leipzig (Alt-Leipzig). I made the photos above on 2 December 2014. Thanks to Auerbachs Keller, Leipzig Tourismus und Marketing GmbH (LTM), InterCityHotel Leipzig, and the MDV Mitteldeutscher Verkehrsverbund regional transport authority for their warm hospitality. This unpaid post appears on Fotoeins Fotopress at fotoeins.com as http://wp.me/p1BIdT-6tV. Hi, Timo. Sometimes it’s still difficult for me to judge how “close” Chemnitz, Dresden, and Leipzig are to each other. I wonder what this place might be like in the middle of summer; perhaps the ambience might be more boisterous? But what really sold me was how fortunate I was to have sat at towards the back of the restauant near the Stammtisch regulars. Thanks for reading and for your comment! Hi and thanks, Penny. Guess I’m getting old(er), but lately, I’ve tended to shy away from noisy restaurants or pubs; guess I also like a little more peace in my life, which carries over to the travel life, too! I was fortunate to see a mix of both residents and visitors in the restaurant; a very good sign to be sure. Goethe is highly revered in Germany; he is to Germany, as Shakespeare is to England. 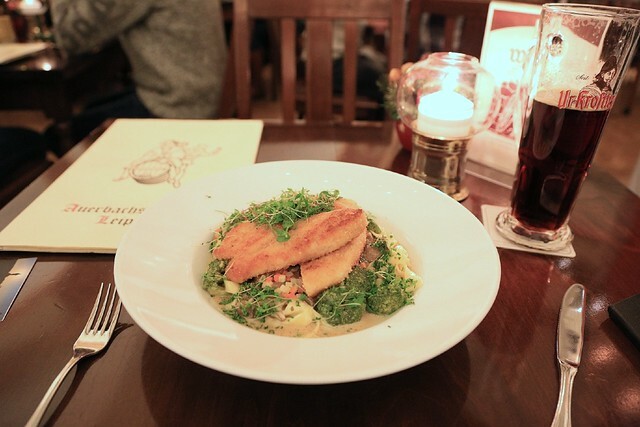 When you’re in Leipzig, give this place a try. Thanks again for reading and for your kind comment! I understand. I’m not a nomadic type anyway. I love that my travels lately have taken me to beautiful places with natural attractions and clean air and water. I’m ready to move somewhere. Reblogged this on The Leipzig Glocal.